Kerama airport was approved for developmentconstructed as a non-public airport under the construction and management of a private company, Kokyo Shisetsu Chizu Koku, in February 1982. The first phase of construction was launched in March and private airlines started operating in July of the same year. In April 1983, two-way ad-hoc flights between Naha and Kerama were approved and the airport was to have regular flights. However, in 1986 the operators ceased flights due to bankruptcy. 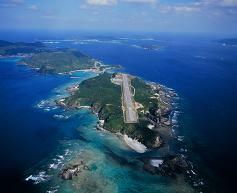 Zamami village succeeded in negotiating with related officials to resume operations, so Ryukyu Air Commuter was founded. The company began operating limited two-way ad-hoc flights in February 1987. In order to contribute to the remote island’s social stabilityisland people’s livelihood island’s socioeconomic status and regional promotion, the Okinawa Prefectural Government designated Kerama airport as a type-3 public airport (to be installed and governed by the prefecture) and brought it into service in November 1994. 1992/ 4/ 1 The rights of establishment and administration of Kerama Airfield was transferred to the Government of Okinawa prefecture.